Hey, Ladies! Week 3 is already here, and OMG the girl drama in full swing. Get excited. But before we get to this week, let’s take a walk down memory lane just in case you missed anything. Click HERE for the season premiere, where I crowned a sloth the winner. Click HERE for last week’s recap, where we all learned that we need to have a memorized toast in our back pockets just in case the occasion arises. Harrison dropped by the mansion to let the ladies know that this week there would be 2 group dates and 1 amazing 1:1. I’m looking for life’s greatest treasure. So did you notice? The two pageant queens are on this group date TOGETHER. And if you don’t recall (of course you do), they had a falling out when Caelynn beat Miss Alabama Hannah when competing for Miss USA, and Miss Alabama Hannah did not like that. Not at all. Or so we’ve been told by Caelynn. FIGHT! FIGHT! FIGHT! And you know who else is on the date? Tracy and Demi. FIGHT! FIGHT! FIGHT! This is gonna be good, y’all. 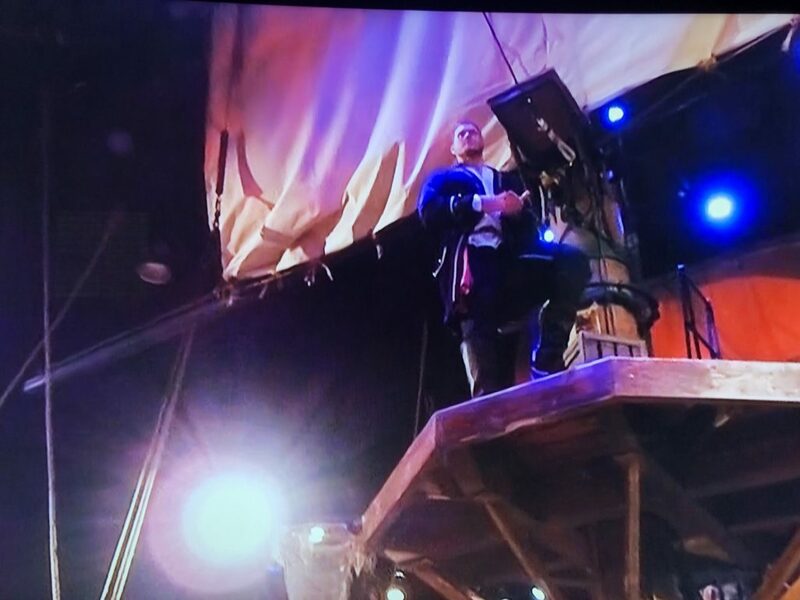 They arrived at a theater (of sorts) where Colton was dressed as a pirate and standing on the crow’s nest (yes, I had to google that) of a pirate ship. He took part in some pirate drama, “fought” two other pirates, and the girls went wild. Then it was time for the girls to prove their love by showcasing their pirating abilities. As one does. 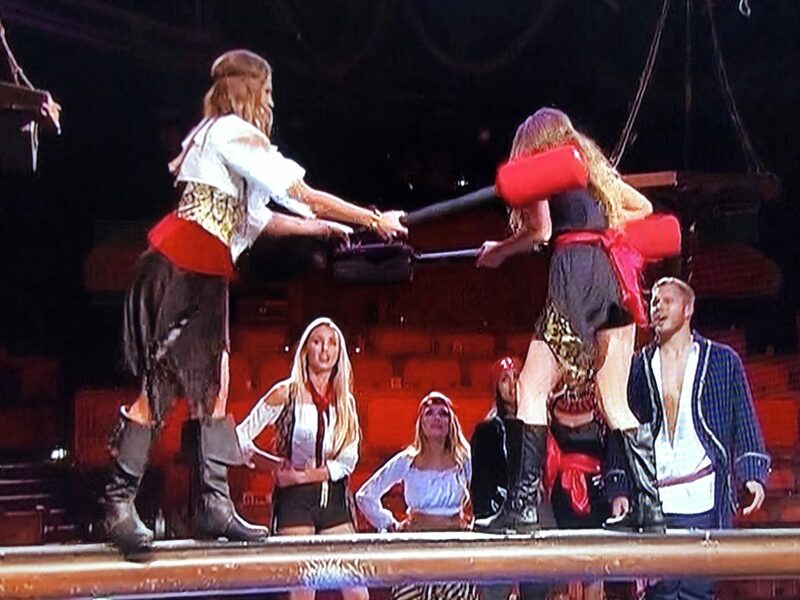 So they got all dressed up in some questionable pirate attire and competed with each other for the final 2 spots to fight for alone time with Colton that night. For the record, I think they were just acting like American Gladiators in pirate costumes. This is how Miss Alabama Hannah felt about it all. Interestingly enough, this also illustrates how I feel about Miss Alabama Hannah’s attitude. I think it’s safe to say the girl is not going to be bringing home any Miss Congeniality titles anytime soon. And good news, y’all. She did in fact immediately begin the spiraling process. Miss Alabama Hannah decided that she was going to need to save Colton from mean ol’ Miss North Carolina by letting him know ALL her thoughts about her arch nemesis. 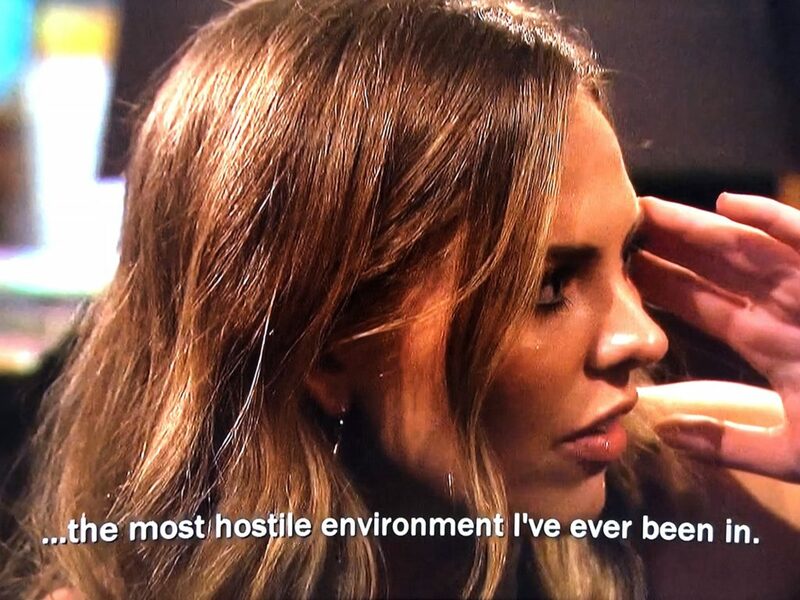 I knew it wasn’t a good move on her part because she was going to be breaking one of the most important unwritten rules of Bachelor world: DON’T TALK TRASH ON ANOTHER GIRL TO THE GUY. Why, you ask? 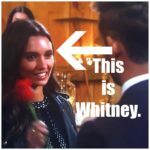 Well, this unwritten rule was established early on in Bachelor world for several reasons: 1) it ALWAYS makes you look desperate, 2) it ALWAYS makes the bachelor question your intentions, and 3) it almost always ends with the girl that is initiating the trash talking eventually getting the boot. That night they headed to Big Daddy’s Antique Store (random) for drinks and conversation. And as previously mentioned, trash talking. With a side of self sabotage. I’m looking at you Miss Alabama. Oh, and the night also involved some spanking, but we’ll get to that in a minute. When Colton was having his first 1:1 time with one of the girls, some other girls were sitting around casually chatting pressing each other’s buttons. Tracy is 31. She’s not 81. Demi then told Tracy that she felt like she was being passive aggressive towards her and attacking her. And Tracy was all “okay”. And Demi ended it by saying “I feel so bad for you.” She then explained further how all of the the younger girls (including her) are so beautiful, so of course Tracy is freaking out. I can’t with this one. I think she’s ridiculous. But I’m here for it. Demi went in for her alone time. She said, AND I QUOTE, “Every time I smell you I’m like mmmmmmmm” while audibly moaning. And to be honest, Colton looked both excited and petrified. I understood both emotions. While alone together, she ran the gamut: she cussed, she blindfolded him, she spanked him (with a piece of wood that looked like it would make a perfect charceuterie board), she did her freaky little laugh, and then she caressed his body with a fake hand and got awkwardly close to his nether regions (while he was still blindfolded). Here’s the deal, y’all. Demi is never going to be the final girl standing, but she’s adding plenty of highlights to her Bachelor In Paradise audition tape. #wellplayed You know that had to be her end goal in the first place. Demi told the cameras “I’m the only who who challenges Colton, and I excite him and I make him nervous.” I’m SO CONFUSED by this. I mean, I think we can all agree that she makes him nervous. But how does she think she is challenging him? I want answers. And then it was time for his alone time with Caelynn. He apologized for their seriously awkward kiss earlier (in the pirate drama), and he said he wanted to do it over. So he did. Never Been Kissed Heather then encouraged Miss Alabama Hannah to tell Colton if she really felt that Caelynn was wrong for him. That’s all it took. Just a tiny little nudge. Hannah then told the cameras that she was “befumbled” and “shook” by his interest in Caelynn. At least, I think she said “befumbled”. I had to replay it around 17 times before finally arriving at “befumbled”. I’m going to give her the benefit of the doubt and assume she meant to say “befuddled”, which is a verb that means “unable to think clearly”. Yes, this has to be what she meant. A hostile environment? Those are big words. And I have to say, I’m not buying what she’s selling. Mainly BECAUSE SHE GAVE HIM NO SPECIFICS. NOT A ONE. He then started playing twenty questions with her: was she mean? manipulative? fake? She didn’t answer verbally at all, she just kind of shrugged and nodded in agreement. And looked at him with freaky eyes. Please see Exhibit A below. Colton walked right back into the group and asked Caelynn if they could talk. He straight up asked her what the deal was between her and Miss Alabama Hannah. She wasn’t specific at all either, but she started crying what seemed to be very real tears. She explained that things had happened in her life that she plans on sharing with him, but just not yet. Is all of this related? WHAT THE HECK HAPPENED AT MISS USA? I would like to call upon all my followers. If you know somebody who is associated with the Miss USA pageant and/or knows one of these gals, THROW US A BONE. Miss Lousiana? Miss Texas? Miss Rhode Island? COME ON! SOMEBODY FESS UP AND TELL US WHAT WENT DOWN. And then he gave Caelynn the group date rose. And then Miss Alabama Hannah internally exploded. First off, I would like to mention that Elyse is 31. And because of that I would like to say a big fat TAKE THAT, DEMI! 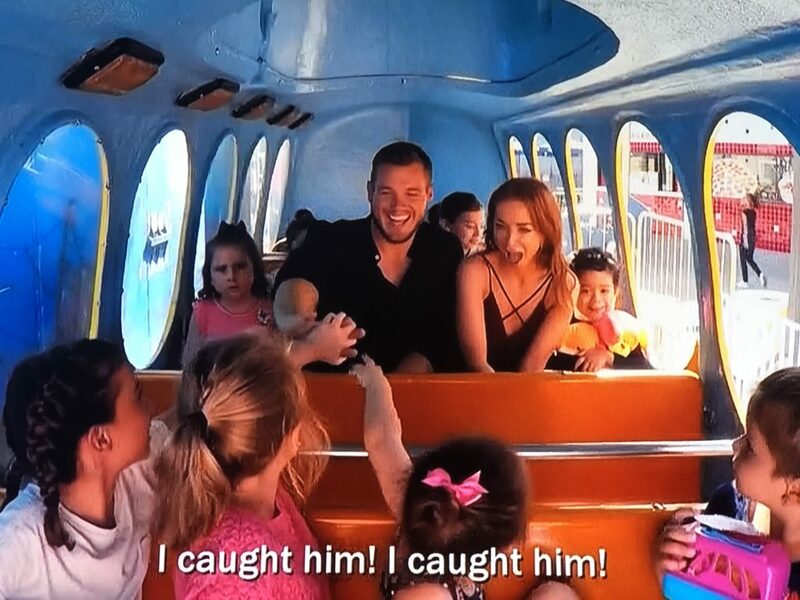 They hopped in a helicopter and headed to Belmont Park, an amusement park. He broke it to her that it wasn’t going to be a 1:1 date as planned, but a group date. Just when she was on the edge of being hella annoyed, a ton of kids ran around the corner that were from a local Children’s hospital. And hold on to your ovaries, ladies… because Colton was in his element. Watching him with the kids was enough to make even the strongest of ovaries quiver. He was so sweet and so incredibly natural around all of the kids. You could tell that he loves kids, and kids love him too. I was realllllllllly digging the man during this date. 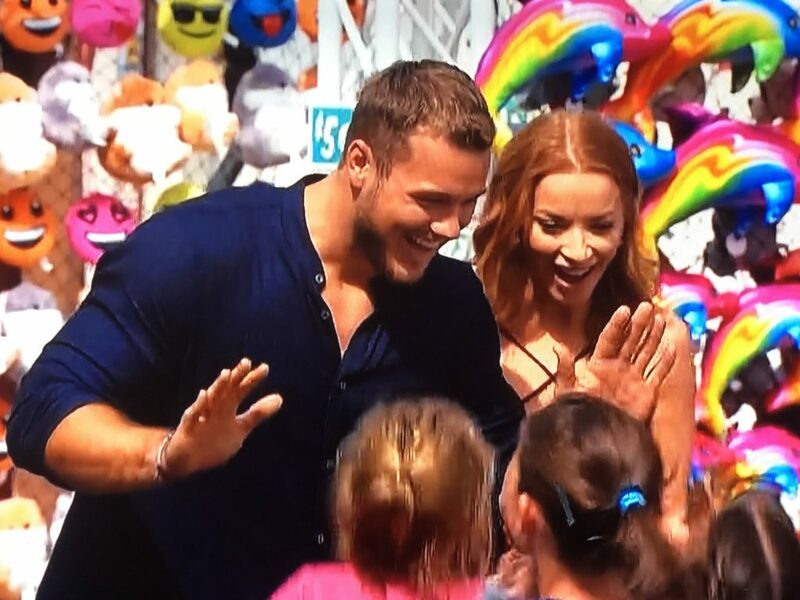 Colton and Elyse jumped on a roller coaster by themselves, he had them stop it at the top, and he kissed her and told her what a great time he had with her and the kids. It was a nice little moment. That night they headed to a private dinner, and they were totally vibing. The conversation flowed naturally, and you could tell that they really liked each other. Colton complimented Elyse on her confidence and independence, which led her to share with him about losing her sister several years back. It was a truly heartbreaking story. The sister was pregnant with her 2nd baby when they found a cancerous tumor, and the sister focused on delivering a healthy baby, which meant she wasn’t able to participate in a lot of treatment and ended up passing. After her sister’s passing, her family started a charity. These two are peas in a charitable pod. I like them together and think they would make quite a team. But do you know what I would like even more? Elyse as Bachelorette. He gave her the rose and then they swayed back and forth during a concert with Tenille Arts. I don’t know who she is, but I do know that I like her lipstick. For every strong man, there’s an even stronger woman. The next date began with a shirtless Colton. Cue the high pitched squeals. Terry and Rebecca Crews were waiting for them all in a warehouse and they started leading different exercises to warm everybody up for some very strenuous competition. In case you didn’t know, this is a date that I would not be thrilled about. Spandex AND working out? No thank you. And then Sydney showed Colton how flexible she is. 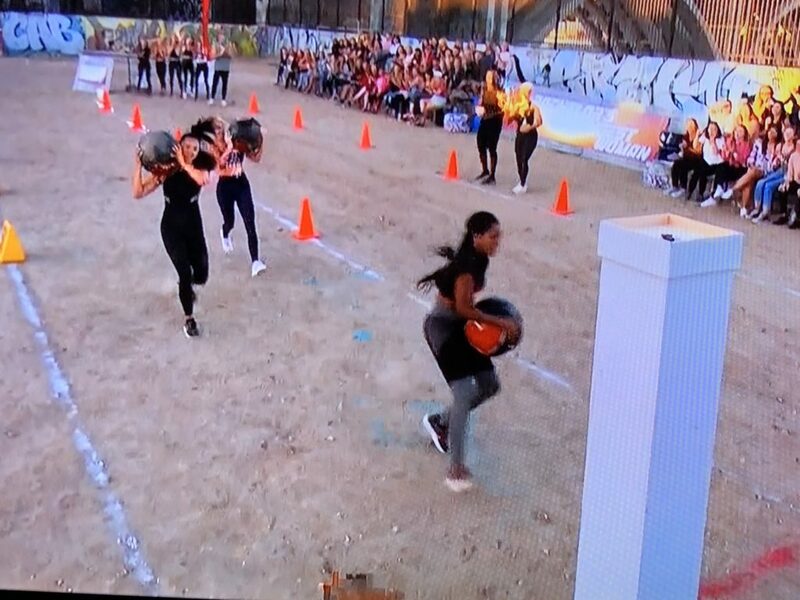 There were 3 finalists, and they had to race with Colton’s heart (a REALLY heavy weighted ball) and then put it on a pedestal. Onyeka won. Next he sat down with Caitlin. He gave her a chance to open up, but she fell short. Woefully short. 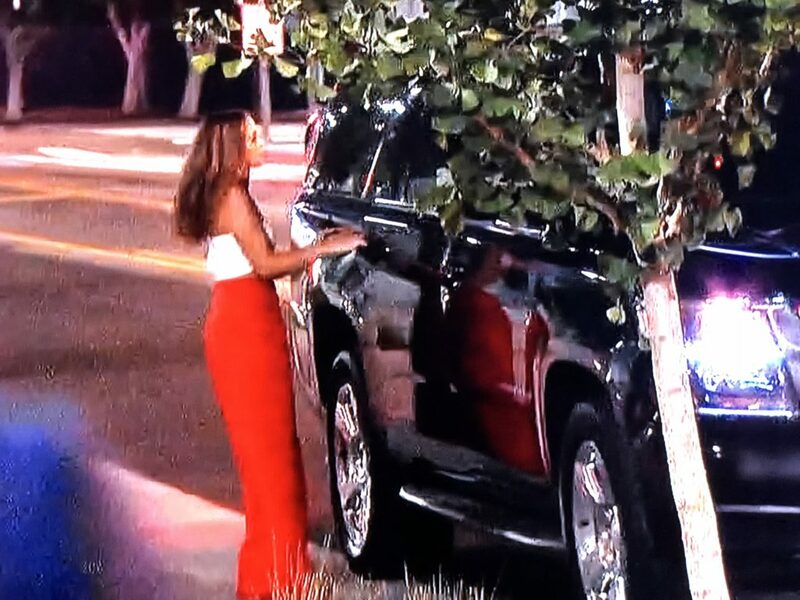 I was just glad she got to ride in the rejection SUV instead of pull it. Harrison popped in to talk about how things got real this week when Colton let Caitlin go. He then broke the news that there wouldn’t be a cocktail party. But don’t worry rose lovers, there’s 30 minutes left, so we are going to get a pool party instead. And a pool party is just a cocktail party in tiny swimsuits. Let’s take a minute to gawk over the 31 year old’s body. Ai-Chi-Wa-Wa. The group shed their clothes, Colton shed his shirt, and they all started hanging by the pool. He talked to several girls, including the other Hannah. Remember that Hannah’s job description is “content creator” and I wondered what exactly that was? Well, I had several readers message me to point out that Hannah models over on this site where I know many of you already love to shop! They carry my $55 sunglasses in black (and that’s Hannah wearing them! ), and I love the following: this relaxed sweater, these cropped jeans, this white sundress (that would be so cute under the soft yellow denim jacket on Monday’s post), this pink white and grey cardi, and this THML embroidered dress (also on Hannah)! He explained to her that he didn’t include her in any dates that week only because he was confident in their relationship. Hannah was fresh faced and appeared to handle the situation very maturely, even though she still looks 13 on a good day. Just on the outskirts of the pool party, Miss Alabama Hannah was talking with Never Been Kissed Heather. And I’ve decided that Heather might not know how to kiss a boy, but she sure does know how to stir a pot. 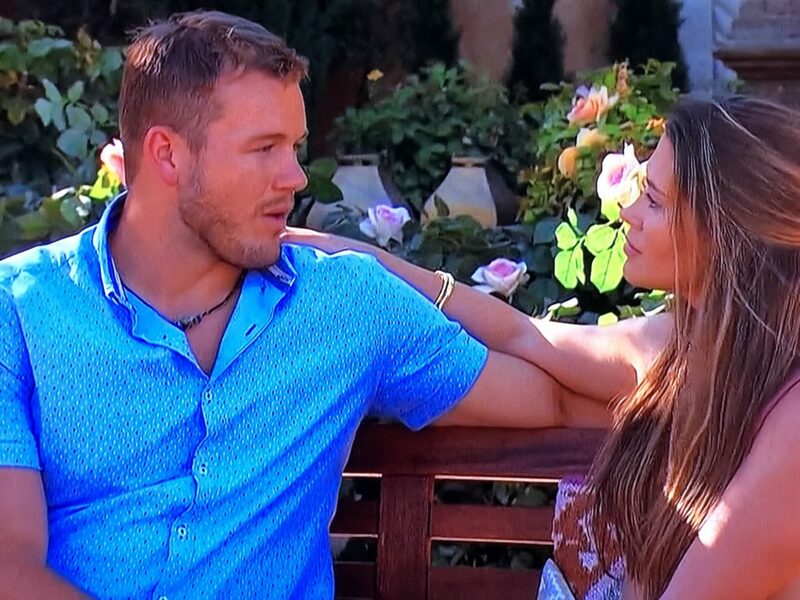 Hannah explained that if the relationship kept progressing between Caelynn and Colton that she was going to start raging and let the “beautiful monster” that lives inside of her out. She seriously said that. And then she did this growl/hiss combo thing. It wasn’t representative of the values upheld by Miss USA. 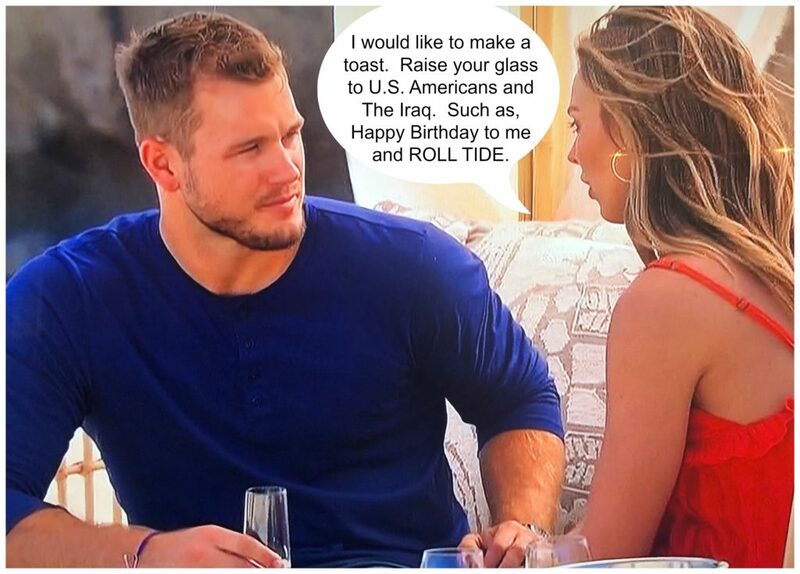 And it was unbecoming to a Miss Alabama. I had two immediate thoughts about the growl/hiss moment: 1) she was going to regret it and 2) it looked oddly familiar. Colton then went off with Caelynn and she laid it all out on the line. She told him that Hannah was manipulative and toxic, and that when she started advancing in the pageant circuit that Hannah was not supportive. I know I don’t know what really happened between these two pageant beauties, but for some reason I’m believing Caelynn over Hannah. Do y’all feel the same? 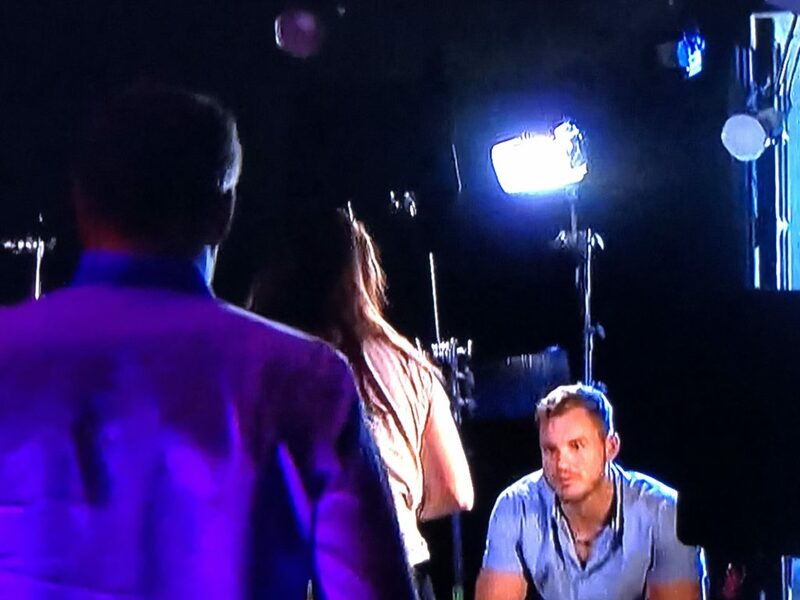 Colton then went straight to Hannah and said that Caelynn used words like “manipulative”, “toxic”, and “deceitful” to describe her. And Hannah was like, “Nope. I’m not.” She then turned around and said the exact same things about Caelynn. And round and round they went. It was the good ol “I’m rubber, you’re glue” defense. I didn’t hear either girl giving specifics, and that’s what we needed. That’s what Colton needed. SPECIFICS. She’s fake? Tell me how. She’s manipulative? Tell me how. She’s toxic? FREAKING TELL ME HOW. We need direct quotes, we need story lines, we need circumstances. We need Caelynn to say, “Listen, here’s what went down. I won the talent competition while twirling a fire baton to We Didn’t Start The Fire. Hannah didn’t like that I won or that I could twirl a fire baton, so she lit my baton on fire back in our room and left it on my bed with a message written in lipstick on my white bedspread that said ‘I hope you burn your fingers off with your flaming baton.’ ” A story like this would help us form an opinion and take a side, right?. But neither one of them are giving us any real life examples of why the other girl is so terrible. Colton was so confused that he headed behind the scenes to talk to different crew members and Harrison. Nobody offered up any real advice. Harrison just kind of nodded and was like yep, you’re in a pickle. Please sound off in the comments with your thoughts. Talking points: Who is your favorite? Who should go home next? Are you Team Hannah or Team Caylynn? What was your favorite part of today’s recap? 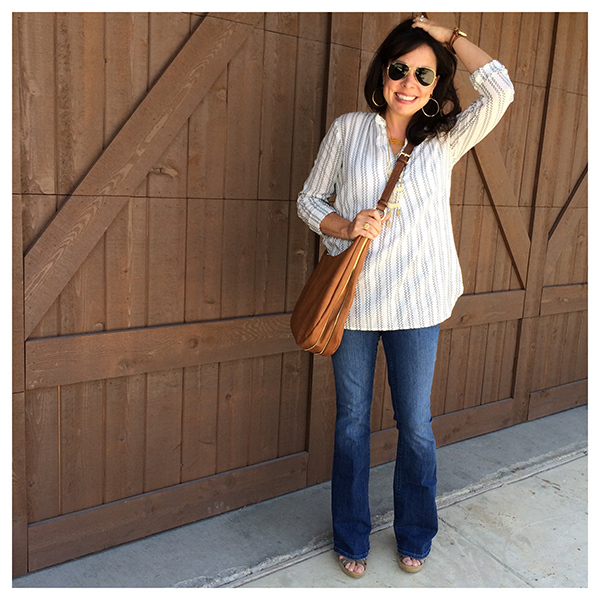 Before you go, if you didn’t see my last post on all my Amazon finds, click HERE! LOTS of things that I’m absolutely loving – Including this $20 camel sweater that I HIGHLY recommend, this super soft sweatshirt cardi, and my new favorite leggings! 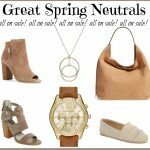 And if you are dreaming of Spring like I am, click HERE to see some of my Spring picks! And if you are a Shoreline Converse lover like me (they are a great transitional shoe), there are tons on sale to choose from right now! That’s it y’all! Remember to leave your Bachelor thoughts in the comments, and I’ll see you back here on Friday! Last thing, for all of you make up junkies out there, Bobbi Brown just released a new limited edition eye palette and it looks AMAZING. And there’s tons of beauty gifts with purchase at Nordstrom right now that you can check out here. 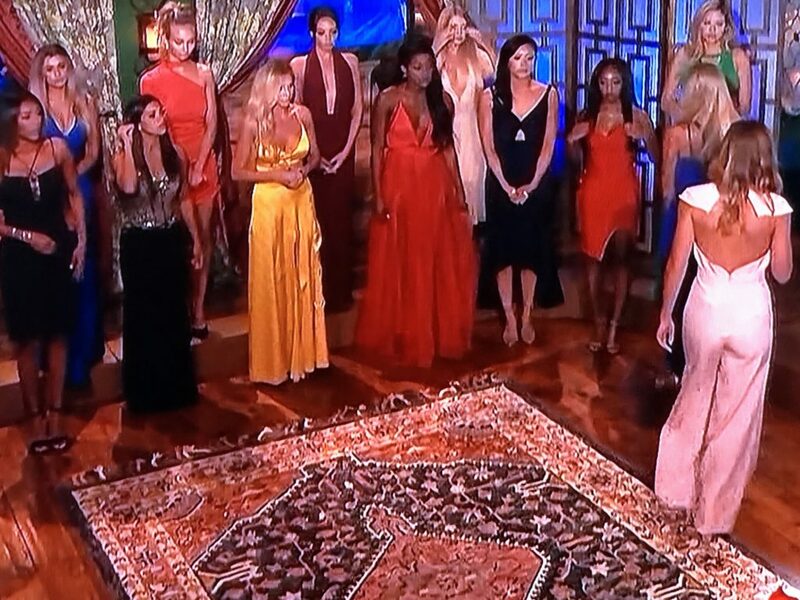 The Bachelor, Episode 2: Is There a Pageant Coach in the House? You’re right…I could happily pick a side if I heard a flaming baton story! At the moment, I’m hoping he send both ladies home STAT! I seriously don’t need to watch the show…your reviews are way more entertaining 😉 . I wasn’t sure who to believe at first either, but I think I’m leaning towards Team Caelynn. But like you, I want specifics!!!!!!!! I’m just not sure if we will ever get the whole story 🙁 I don’t really have a favorite yet. Elyse really surprised me tho!!!!! 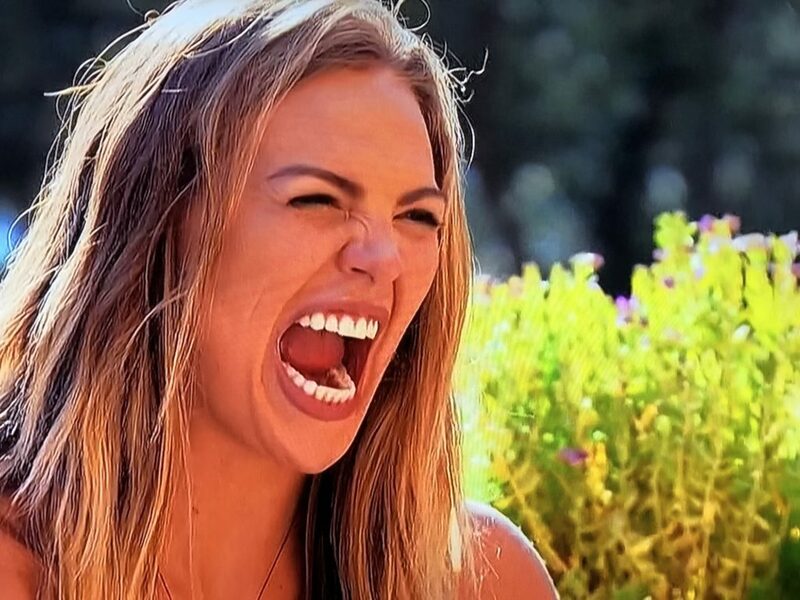 Yes, I think I’m on team Caelynn, but only because Hannah seems to be off her rocker. Haha! Great recap, friend! Definitely team caelynn. You can tell Alabama Hannah is crazy by how many times she’s mentioned spiraling. Also I noticed caelynn brought up she knows how strong Hannah is multiple times on the group date. It made me wonder if something had actually gotten physical during the pageant disagreement. I feel like it’s between Cassie and Hannah G for the win. And Hannah G definitely looks 12. While I agree that Caitlyn could have opened up more about SOMETHING in her life, I laughed out loud when she shrugged and said “I don’t know what to say, I’ve had a good life.” As a person who normally rolls her eyes at some of the straws these ladies grasp at to come up with some sort of traumatic life event, I found this to be a great statement! I look forward to your Bachelor Episode Wednesday reviews, even more than I like to watch the bachelor! Your “We didn’t start the Fire” circumstances with the fire baton … nailed it!!! Love Wednesday mornings! Yes!!!! As a fellow SLP, you always exactly what I am thinking! Please give Cassie a one on one date to help Colton progress from word level to conversation. Can we talk about how much I can vibe with Nicole LITERALLY not moving the 100lb cake… my spirit animal. OMG these recaps are GOLD. I haven’t watched this season but I’m 100% confident these recaps are even better! Great recap! You and I think very similar, but you are way more entertaining. Quick question: have you read any spoilers on the outcome of the show? 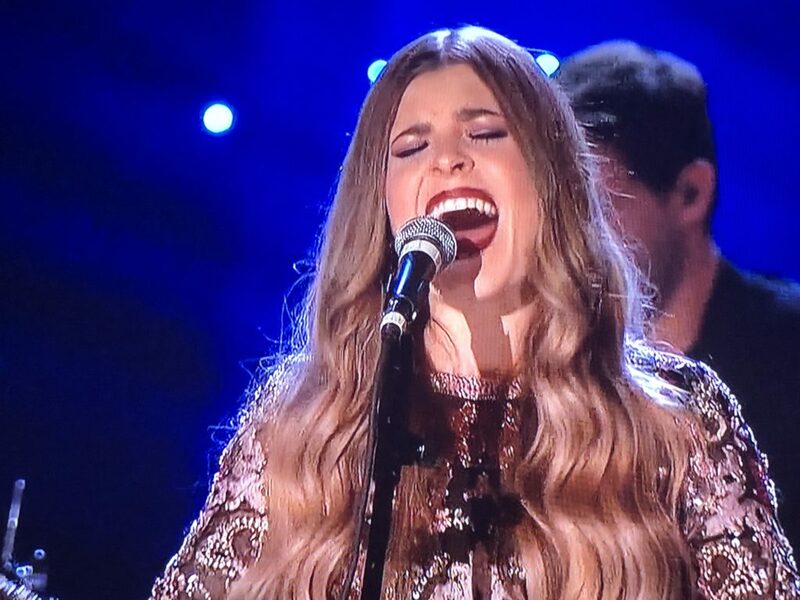 The fact that Caelyn is a little more articulate than Hannah gives her the win – not! Caelyn is just a better actor than Hannah and I can definitely see why Hannah described it as a toxic environment. Oh, and as far as who won night one? 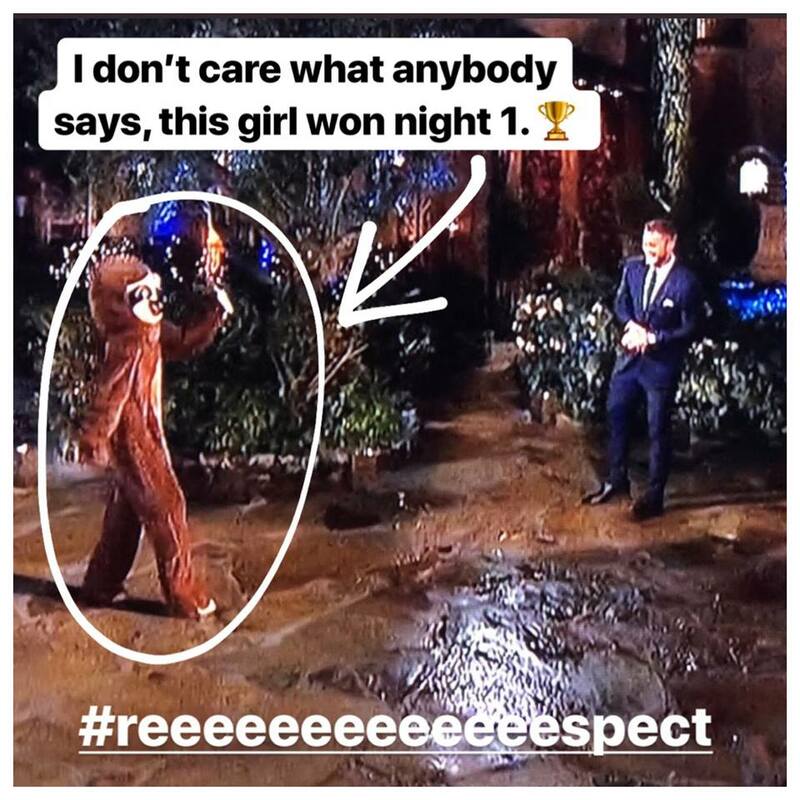 I think the sweet girl at the end, Devin, won night one. Even through the tears, holding her composure while all the other girls celebrated behind her, she showed true composure and just how sweet she is, beautiful girl! Hope she finds her Prince Charming! I agree! I feel like Caelyn is more polished, so they’re playing it up like she’s the reasonable one, but I think it may turn out the other way around. It is editing to create drama…we’ve seen it before! 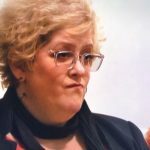 As an SLP, I truly enjoyed and respected your comment about correcting Colton’s /s/, /sh/, /ch/! I laughed OUT LOUD while reading that portion! My current favorites: Hannah G., Elyse! My thoughts of the pageant drama: send both of them HOME! I look forward to reading your blog every Wednesday! I don’t know who is right, I really believe they both think they are telling the truth. I see this all heading toward the perfect storm of a 2 on 1 date. As a fellow speech therapist I totally agree with you on his lisp! It was really obvious during his one on one time with Elyse! There’s hope for him yet! I think the Caelynn/Hannah feud is the classic result of two different personalities competing against one another — one isn’t necessarily right or wrong. However, I definitely think Hannah is at fault for bringing it up AND how she is handling it after the accusations. At the very end of the episode we see her crying and saying she hates Caelynn, which just highlights her lack of accountability to the whole situation (as in: she totally brought this on herself and is now unable to handle the fallout of her choice.) She’s just lacking emotional maturity. I also think Caelynn is perhaps getting a better edit, we know this is possible by history of the show. In other news: DEMI. I can’t stop watching her but I cringe and hold the blanket over my face! Interesting fact: Cassie isn’t actually an SLP…. an apology was posted on her Instagram. She is just now starting her grad program after taking time off to be on the show. Look up her instagram! Apparently she got a lot of heat for it. Not to say she isn’t cute!! She is adorable. But not sure why she didn’t say she was a student. Also- Team Caelynn for battle of the beauty queens… haha I am really hoping for a 2 on 1 here! You are so funny, Sheaffer! I always look forward to watching The Bachelor and thinking “what is Sheaffer going to say about this? !” Thank you for the laughs this morning! I’m definitely feeling like Caelynn is the more sane one, although we definitely need the specifics of both sides of the story. I think it was Hannah who in her first episode intro video at home stated she was a “hot mess,” which she’s living up to! At first I thought it would be Demi and Tracy on the 2:1 date, but I think we can all agree it’s going to be a beauty queen showdown, which will be sad. I’m looking forward to learning more about the other ladies who haven’t gotten much screen time and am definitely ready for some of them to go! I don’t know if this helps…I went to college (TCU) with the girl who won MIss USA (Sarah Rose Summers/Miss Nebraska) when Hannah and Caelynn were competing. Now, i only met Sarah a handful of times but she is the absolute SWEETEST girl i have ever met. Based on Sarah’s instagram it seems as though she is friends with Caelynn and she has commented on her instagram that shes rooting for her on The Bachelor. So I think that makes me Team Caelynn (even though this drama seemspetty). Love these recaps so much!! I honestly gave up watching the show years ago in lieu of your posts!! My faves: Cassie, Hannah (the 13yr old) and Elyse…. Get rid of these psycho pageant girls. But I do agree, it will be a perfect 2 on 1 date! I love your recaps and watch the show wondering what Sheaffer will say about this. That said, I blame you because I can’t look at Hannah without seeing the teenage pageant girl. Are they one in the same? Boy, they look alike. Your recaps are so funny and I appreciate you taking the time to write them. I give you the 🌹this week. Thanks for making me laugh out loud numerous times. This season is so hard to watch! I had to rewind “befumbled” as well to make sure that was indeed what I heard…then I started wondering if that was even a real word…well, according to the Urban Dictionary it can mean both an oddly shaped cranium or sexually confused…so, way to articulate yourself Miss ‘Bama. And the other Hannah? All I can think of when I look at her is “you better shape up…’cause I need a man…and my heart is set on youuuu” If she isn’t a young Olivia Newton John I don’t know who is! Team Caelynn because she seems genuine and I’m from NC!!! And yes we need specifics! And I can’t believe the model from Red Dress is on here…I knew she looked familiar. I think I’m on Hannah’s side. I was iffy, until Caelynn sat him down and said “this is what happened” at the pool party. That felt manipulative to me. I don’t think Hannah should have said anything to Colton to begin with, but I believe her over Caelynn! Oh. My. Word. This is the best thing I’ve seen all day! Thanks for the laugh…especially the flaming baton story. I’m ready for the Alabama Hannah total freak out and think Caelynn will go off the deep end soon. Crazytown here we come! I think my favorite part of this recap are your speech therapy comments! I’m 47 I had therapy in elementary school for my wonky “s’s”. It worked and has been fine for 40 years. Suddenly my “s’s” are wonky again. There’s a chance I’ll be seeking speech therapy at age 47! It’s so frustrating. I still remember the exercises I had to do so maybe it’s time to resume. Alabama Hannah and Caelynn simply don’t like each other. I don’t think any big event went down between the two. I’ve been behind the scenes at various state pageants for Miss USA and tensions are HIGH. Everyone is nice to each other but when it comes down to who is selected for the finals, top 5, and the winner, things can get messy…Girls leaving before the show is even over, shade thrown at each other on social media, etc. I think it’ll come down to a two on one and both will be sent home. Your recaps are my favorite part of this show! But you didn’t mention my favorite part of Monday’s episode – during the pirate dinner one of the girls (I don’t know who) threw a turkey leg at the stage. I don’t know why that was so funny but The Hubster and I had to rewatch it just to ensure that’s what we saw! It was Demi 🤣🤣🤣 and it was so freaking funny I rewatched it 47 times. I don’t like either girl, but if I had to choose, I choose Caelyn. And Demi is crazy, but hysterical. The fire baton story! I’m dying! My theory is there are no specifics form Hannah & Carlton because it was never a real friendship and it was all just girl drama/gossip. Never looks good on anyone and I predict he will send them both home. If I can just say, my eyes were tired from all the eye rolling I was doing while watching these two pageants girls go back and forth. 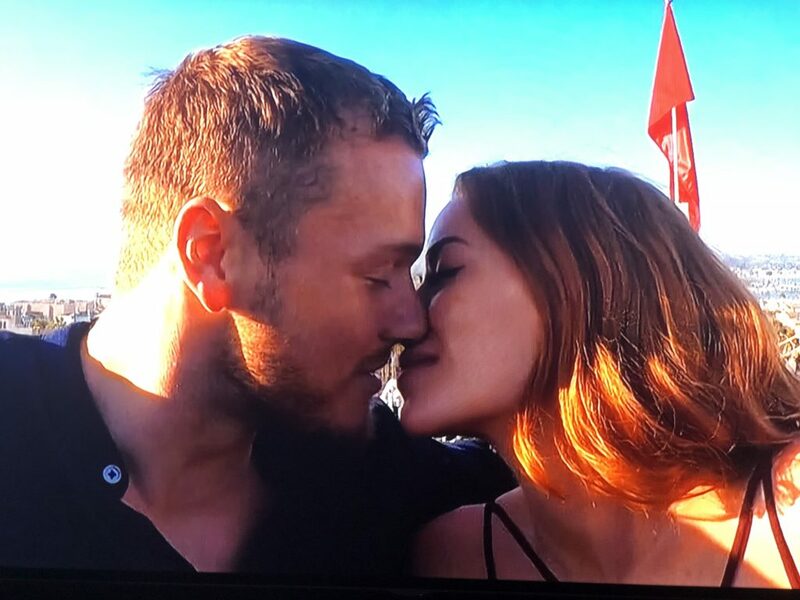 I hope Colton sends them both home. Love your recaps. Thanks for another great recap! Not watching this season, so you are taking one for the team and I love it! LOVE your recaps Sheaffer, you never disappoint! 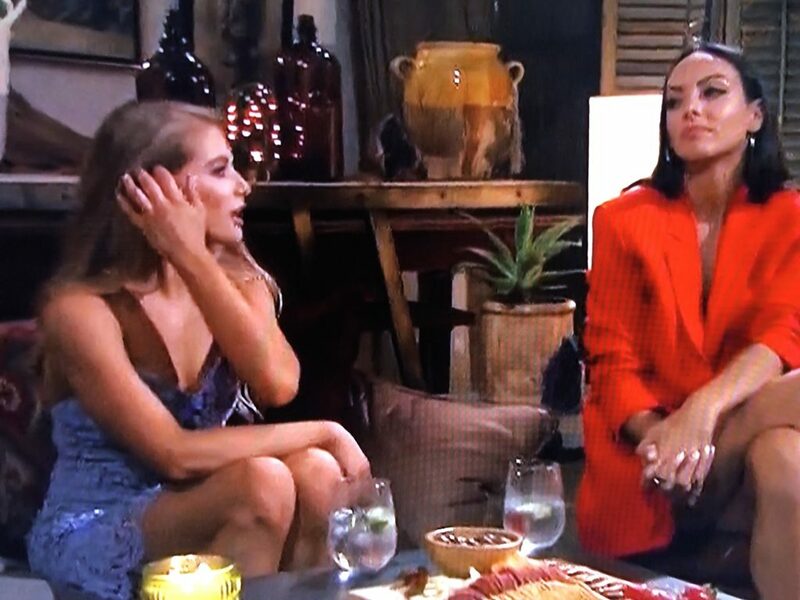 I’m convinced somewhere in the contract is says the producer gets to pick two women who get a rose, until there are only a certain number of women left (let’s say 10 for argument sake)…that can be the only explanation for Demi and Alabama Hannah getting roses last night! OMG!!! I laughed so hard!!! The flaming baton story, I could hardly read, I was laughing so hard. Totally believe Hannah over Caelynn. Caelynn is a better actress I feel but I think some truth may come out later. Hannah is surely a little crazy I feel but I do believe her more at this point. You should do Stand up comedy!!! You are HILARIOUS!! Flaming baton…LOL! My two favs are Cassie and “fresh faced” Hannah. Looking forward to next Wednesday. 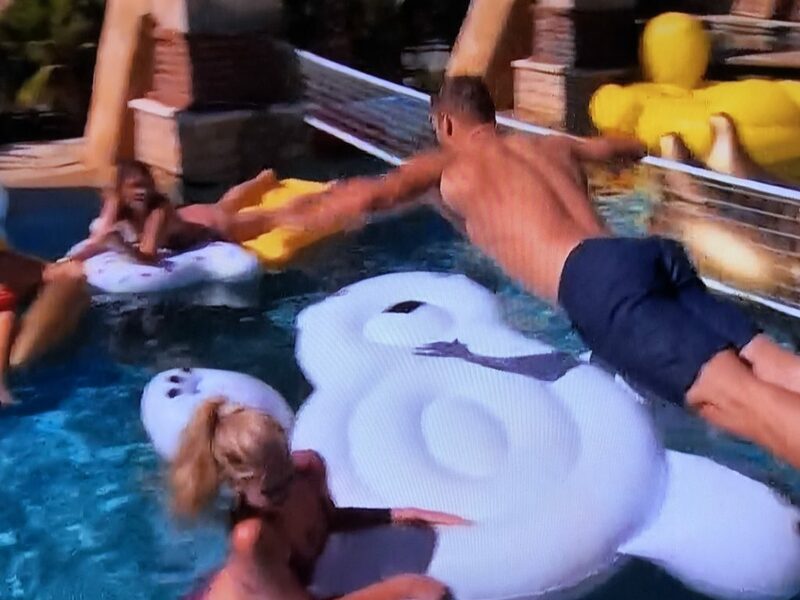 Can we talk about how Colton flipped over the two girls on the raft?!? They were completely dry with drinks in hand and he totally came out nowhere and dumped them into the water!!! Total win for Colton!! And Demi (Ms. Class, herself) threw the turkey leg at the stage! #trashymuch? So funny! I laughed so hard when you said the paddle Demi used looked like it would make a great charcuterie board. That made me laugh out loud. I have so many feelings about this season. They are possibly all skewed by the fact I’m 45 and this season’s hot bachelor is only two years older than my son. In the back of my mind, behind the entertainment value, I keep thinking “would I want her dating my baby boy?” This is how having grown children screws up your guilty pleasure entertainment. Miss Alabama Hannah is open about the fact that she’s a hot mess and spirals constantly. 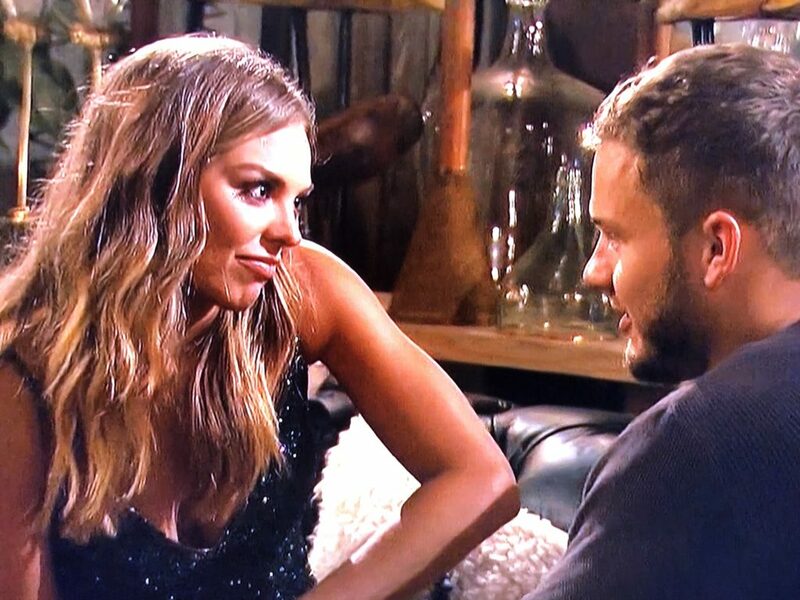 It gives you the chance to say “Look, you have some good qualities, but I just can’t handle your kind of crazy.” I think she’s definitely going home before Caelynn. 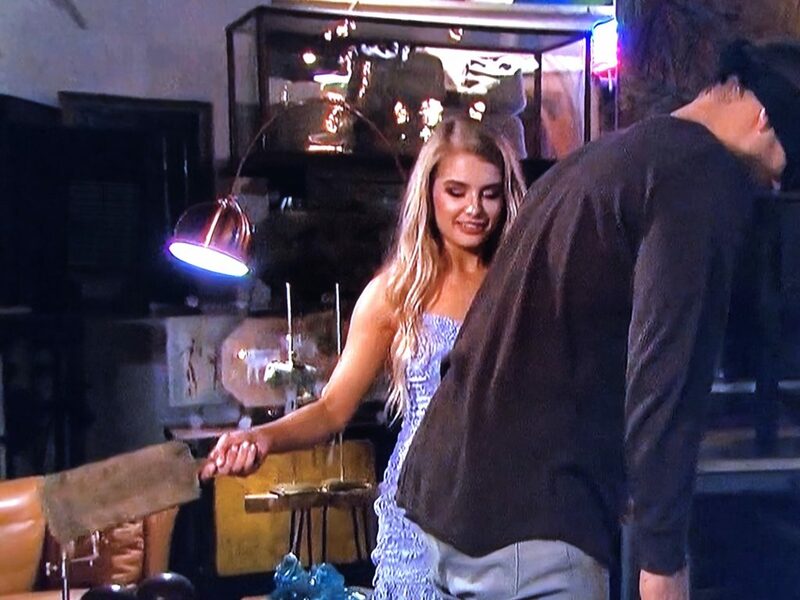 I’m not believing Caelynn is innocent here, I think she goes after what she wants and it doesn’t really matter who she has to stab in the back. The drama makes for good TV but I don’t see her getting the final rose. Cassie comes across as so nice and real. They did seem good together this week. 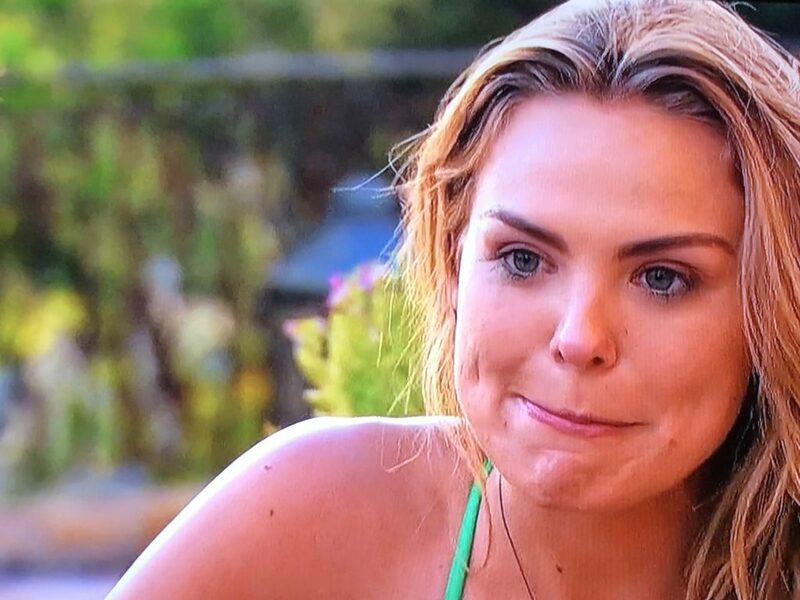 I also like Elyse and would love to see her as the next Bachelorette. 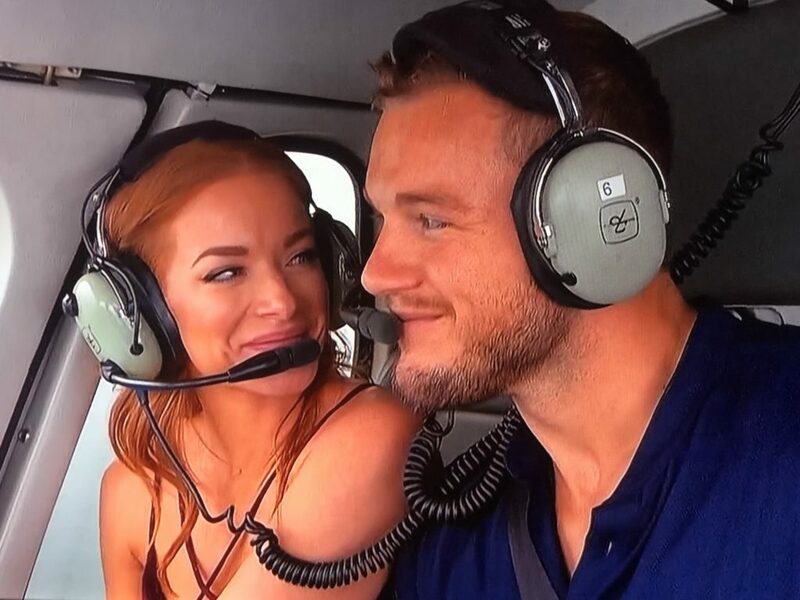 Demi is great entertainment; Bachelor in Paradise seems like the perfect place for her. I have no real thoughts about Never Been Kissed Heather other than she seems like an experienced pot-stirrer. I’m so glad you do these recaps – I’m pretty sure they’re the best part of the show! I’m team Caelynn only because Hannah was the one to started this whole mess. For real, why don’t either of them have one example? My faves are Elyse and Cassie. I thought Cassie gave Heather great advise last week when she was encouraging her that never having kissed anyone was no big deal and would set her apart in a good way. Little Miss Heather did not pay the good advice forward this week though! She should have been talking Hannah off the ledge, not telling her to jump!! 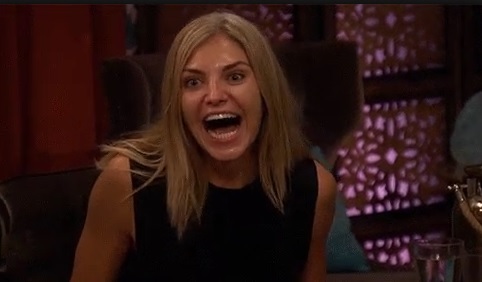 Definitely rooting for Elyse as bachelorette! She is AWESOME and so classy and pretty! I am team Miss Alabama Hannah’s rose ceremony jumpsuit! Any guesses where it’s from? I don’t know! So sorry, Alex! Check out Hannah’s Insta stories- it’s listed there! 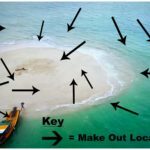 Here is an interesting article about HB & C that I thought you might enjoy. I’m definitely team Caelynn, but I agree with you, some specifics would be nice (although I bet your rendition is way better than the actual story)! Great review as always!! !